The Miccosukee Resort and Gaming facility is one of the best in the Miami area. Miami is a fun and exciting city where there is a lot to do and there are many gambling venues. From slots and poker rooms to table games and race tracks Miami has it all. Online gambling is technically illegal in the city of Miami, but there are online offshore casinos, card rooms, dog and horse tracks, and casinos located on Indian reservations. One of the nice things about gambling in Miami is many of the venues are located in the city itself so you do not have to go far for some action. In the city of Miami there are 18 casinos and nearly 5,000 slots and gaming machines as well as over 75 live poker tables. In Miami you can find any table game to play with various limits so from Texas Holdem and Roulette to 7 card stud and 3 card poker Miami has it all when it comes to table gambling. The table limits range from one cent all the way up to $400 so it does not matter if you are a low stakes player or a high roller you will find the game you are looking for and the table limit you are comfortable with. Some of the casinos in Miami also have world class dining and hotels and in all the casinos combined there is over 45,000 square feet of conference space. Horse and dog racing is big in Miami and many of the racetracks have slot machines and poker machines as well. 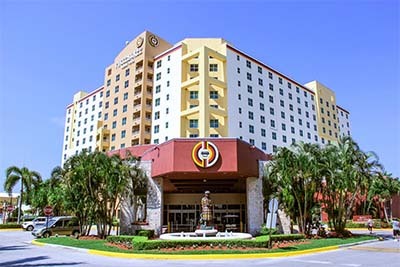 Miccosukee Resort and Gaming – The Miccosukee Resort and Gaming is the biggest casino in Miami with nearly 70,000 square feet in the casino. There are 1,900 slot machines, 32 poker tables, and a bingo room with 1,000 seats. It is 25 miles from downtown Miami and there are many dining options and the hotel has 302 rooms. Magic City Casino & Flagler Dog Track – The Magic City Casino & Flagler Dog Track is only five minutes from the airport and it has over 800 slot machines and 19 poker tables. There is a poker room that caters to both low stakes players and high rollers alike and they also have the only electronic craps and roulette games in Miami. Dog racing has been available since 1932 and there is also Simulcast betting available every day. Calder Casino & Race Course – The Calder Casino & Race Course is a newer casino that has 1,200 slot machines, horse racing, and poker and all of the popular table games. The limits vary and they have very solid promotions and giveaways. They offer live music and good buffets and the location cannot be beat. These are just a few of the larger casinos in the Miami area, but there are many, many others such as the Isle Casino & Racing, Seminole Hard Rock Hotel and Casino, Mardi Gras Racetrack and Gaming, and Gulfstream Park Casino and Racing to just name a few. No matter what game you want to play and the limit you want to play it you will find it in the Miami area. From penny slots to high stakes poker games and everything in between Miami offers many gambling options for any type of player. The glitz and glamor of the city can be found in some of the bigger casinos in the area and there are also many smaller casinos that are quaint and nice places to gamble. You will find many of the casinos on Native American reservations in and around the Miami area and they are very easy to get to and some of the bigger ones also have shuttles to and from the airport.